We are happy to share with you the 8th edition of the Global Alliance of Waste Pickers newsletter, “Struggles and Victories: Waste Pickers on the Frontline.” In this three-month edition, we share a few highlights from waste pickers around the globe. In South Africa, SAWPA called on their government to put an end to incineration projects. In the Dominican Republic, waste pickers raised their voices about the dangers they face at a landfill. In Brazil, dumpsite workers continue to fight for their rights to compensation and inclusion, and against incineration. The organized waste pickers of the Uruguaiana landfill saw victory after a successful solidarity campaign. And now, the inclusive policies that were implemented in Colombia are threatened since Mayor Gustavo Petro was removed from office on December 9th. 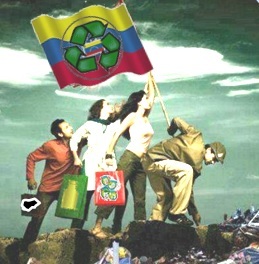 Please take a minute to sign this petition by Bogota’s recyclers urging Inspector-General Alejandro Ordoñez to reverse the removal. It’s been a fruitful season for national movements — with new ones formed in Costa Rica and the Dominican Republic — and waste pickers’ conferences, held in Bolivia, Venezuela, and India. In the Philippines, waste pickers participated in regional organizing workshops. On the Global Day of Action Against Incineration on November 8th, waste pickers from many different countries marched and shared their messages. In Pune, India, KKPKP trade union continues to promote a scholarship program and the right to education for the children of waste pickers. And don’t forget — Expocatadores, an event in Brazil that brings together waste pickers, government leaders and industry, will be held December 18-20 in São Paulo. Image courtesy of EcoWaste Coalition. On September 3, the last of three regional workshops for waste pickers was held in Luzon, Philippines. The EcoWaste Coalition organized the event that brought together 44 waste pickers (not including support groups and organizations) and representatives from different organizations from various sites in Luzon. They crafted the waste pickers’ common agenda, which will improve their welfare and allow them to achieve better living conditions and livelihoods, and eventually a better future for their children. 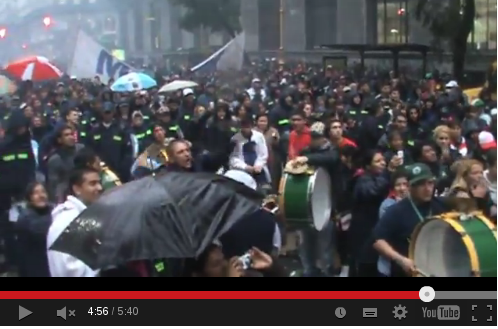 They spoke out against corruption, which tramples their rights for social recognition and legal protection. There exists since 2010 a national framework for the inclusion of the informal sector in waste management but organizers say one of the challenges is its efficient implementation and enforcement. At the workshop, participants shared their experiences and challenges: secure access to waste, exposure to health risks, and insufficient government support. They agreed that taking on these challenges requires building stronger organizations. Read the full article. Read the Unity Statement here. KKPKP has advocated for the unclean occupations scholarship program at the state government level. Stree Mukti Sangatana, a women’s liberation organization that works with waste pickers, has also been involved in this process. KKPKP has also been working at the city and state levels around the Right to Education program for underprivileged children. There have been hurdles and incidents of non-compliance by schools, who continue to harass children and parents. A film on the Right to Education was made to share with different audiences and explain the correct legal position. The Bangalore city corporation (BBMP) has created a dry waste collection centre (DWCC) that manages inorganic recyclable waste at a decentralized level. The city is planning to create 197 such centers. Hasiru Dala’s intervention has resulted in getting 29 centres managed by the informal sector, including waste pickers and scrap dealers. Four waste pickers and two scrap dealers have an agreement with the city to run these centers. Hasiru Dala is a member-based organisation of waste pickers seeking to improve work conditions and ensure continued access to recyclables in the city of Bangalore, India. Hasiru Dala is providing the technical support for the management of these centers. A centralized system to maintain statistics has been established. The potential of recyclable waste has attracted many wholesale buyers and recyclers who have approached Hasiru Dala to buy materials. This could result in better rates for the recycle material that the center has sorted. Read the post. Pressure against the private contractors has been mounting since the Pimpri Chinchwad municipal government (PCMC) withheld payment from the company for violating labor laws. The new contracts proposed by the city government are supposed to ensure that workers will be paid minimum wages. The Pune municipal government has acknowledged the benefits of SWaCH’s low cost and sustainable model and is looking to renew the SWaCH docket. But SWaCH’s position is that changes must be made to the MOU agreement in order for the waste pickers to continue working. Before considering signing a new agreement, the cooperative is demanding that the Pune government revise its cost implications, upgrade rates to SWaCH members and staff, and look closely at loopholes in the existing agreement. Read the full post. Millions of workers are involved in collecting, sorting, recycling, and selling recyclables. Waste pickers reduce carbon emissions by saving energy and ensuring recycling and reuse. They not only serve the environment but save governments money and reduce their carbon footprints. Despite the benefits they provide to society, waste pickers face harsh working and living conditions, and lack rights, recognition and support from the government. In addition, they are denied inclusion in the public solid waste management systems. In Delhi, waste pickers face discrimination from neighborhood associations, police, the municipality, and many others. “They are treated as refugees in their own country,” the petition says. In addition, the petition calls for rejection of “waste to energy” plants, in particular, one proposed for Okhla, New Delhi, where an energy plant was set up in 2012 but has not yet been able to produce any electricity but has continued to pollute the surrounding community. Read the rest of the petition and letter to the government of India’s Ministry of the Environment and Forests. Read AIKMM’s report on the National Green Assembly on Waste Legislation and Waste Pickers, held in October. 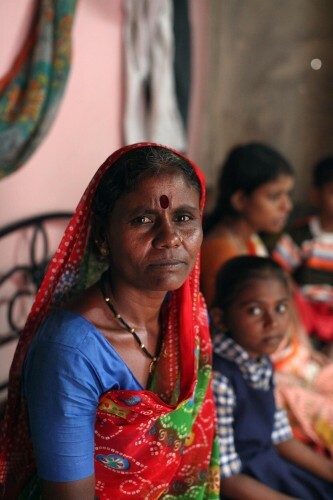 SAFAI SENA: The newsletter “Safainama: Voice of Waste Pickers” is available! Safai Sena published its first newsletter in English. In “Safainama: Voice of Waste Pickers”, you can read articles about waste pickers protesting in Ghaziabad, privatization troubles waste pickers are facing in Delhi, the story of Manwara Begum and the abuse she and her family faced at the hands of police in Delhi, waste pickers working with Chintan opened three schools for children, and the story of Rekha, who was a waste picker and is now managing waste and housekeeping for a crafts bazaar in Delhi. Read the newsletter. SAWPA marching on the Global Day of Action Against Incineration. Photo: SAWPA. 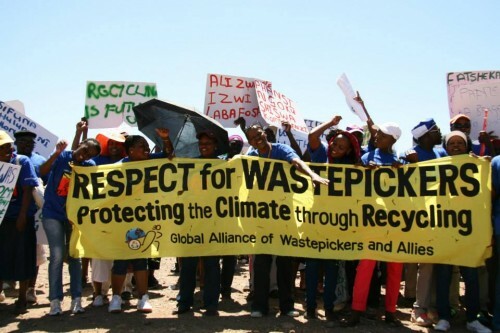 In a letter to the South African department of the environment, the South African Waste Pickers’ Association (SAWPA) called on the government to stop the construction of the EnviroServ waste incineration facility at the Chloorkop waste site. “Waste incinerators represent a failure of good waste management practices and will take away jobs and livelihoods from South African waste pickers. South Africa’s waste management legislation, the Waste Act of 2008 stipulates that incineration must be the last resort in the waste management cycle after waste separation at source, materials recovery and recycling options have been tried and tested.” The letter described SAWPA’s role as an affiliation of collectively and democratically organized waste pickers working on more than 70 waste dumpsites in the country. “The jobs of waste pickers and small recyclers are threatened by incinerators and waste-to-energy facilities as they use recyclables as fuel. 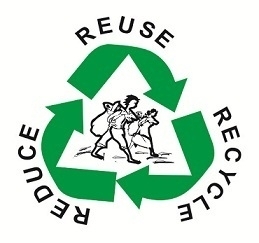 Recycling creates 10 to 20 times more jobs than incinerators,” it reads. SAWPA also called for a country-wide ban on incinerators, investment in biogas and Zero Waste programs, and the support, recognition, and integrations of waste pickers in waste management. Read the full post. 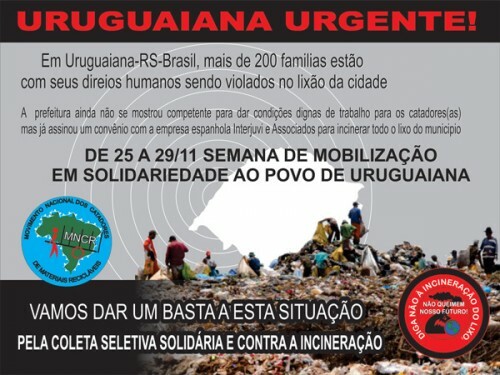 At the end of November, the National Movement of Brazilian Waste Pickers organized a week of solidarity with the workers of the Uruguaiana dumpsite, in the state of Rio Grande do Sul. The waste pickers there have been working in the city for more than 50 years. 75 of the 150-300 waste pickers at the dump have been organized as part of MNCR since 2003. The municipal government has been saying it will close the landfill, contract a private company, and begin incinerating waste. The waste pickers have organized protests and participated in meetings, one of which was attended by the governor and ex-president Lula. During this week of solidarity, the MNCR called waste pickers and allies to show their support for the waste pickers of Uruguaiana. Read the full article (in Portuguese). Update: on November 29, the waste pickers blocked the entrance to the landfill with tires and horse-drawn carts. While that was happening, a public hearing was being held to discuss the waste pickers’ situation.The MNCR presented a dossiê to city leaders at the hearing, documenting decades of violations. They also presented a letter to the Mayor, demanding his signatures. In it were a list of demands, including a proper workspace and a recycling system that integrates the waste pickers, and ending the contract with the incinerator. The Mayor signed the letter, agreeing to meet the demands. MNCR thanks everyone for their participation in this struggle! Read the full post (in Portuguese). On November 20-21, waste pickers came together in the city of Maracaibo, in the state of Zulia, Venezuela, for their 3rd National Conference. The objective of the conference was to begin designing the Waste Pickers’ Plan for recycling collection in municipalities. The Plan will be coordinated and implemented by waste pickers, with the intent of promoting separation at source and a culture of recycling. The mission statement of the conference was to “Promote the Dignity, Equality and Recognition of our labor as waste pickers for society and the Venezuelan government, and incentivize the integration, organization and training of our brothers and sisters in every state of the country.” Felipe Rosario, of the Latin American Network of Waste Pickers (Red Lacre) and Alex Cardoso, of the National Movement of Brazilian Waste Pickers (MNCR) participated in discussions held during the conference. Read the post. Read the follow up post (in Spanish). Photo: Asociación de Recicladores del EcoParque Rafey. 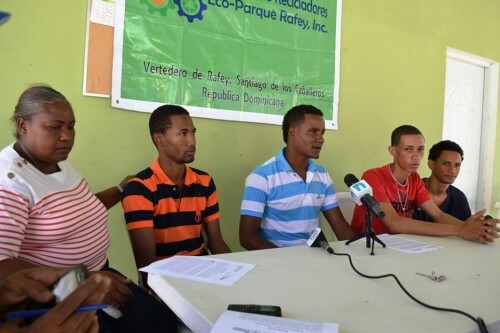 In October, the Association of Waste Pickers of Eco Parque Rafey landfill in the Dominican Republic warned about the dangers of a landfill called the Vertedero Municipal de Santiago de los Caballeros. Because of poor management, the landfill frequently catches on fire. The Association stated that the fires are a result of a lack of management since June 13, 2013. Since this date, operational equipment has remained broken despite the municipal government’s claims that it has fixed it. The Association’s members stated also that the landfill is long past its limit and therefore the waste is being deposited in the streets. The waste pickers of the association want to make clear that they have nothing to do with the fires, which they say are caused by poor management. Where no one is looking, they are putting the fires out with trash, the press release says. The waste pickers called the Mayor of Santiago and the Minister of the Environment to take responsibility for the situation. If they don’t, it’s likely that in a month’s time, they will have to find land for another landfill. Read the full press release (in Spanish). A recent study from the IPEA institute in Brazil revealed the social and environmental contribution of waste pickers and the important role that women waste pickers play. Using census data, the study found that women are the majority amongst organized waste pickers. The study also found that 700,000 children are supported with income from their family’s waste picking. Women have taken on the role of leadership in many cooperatives across Brazil. Women waste pickers organize other workers. Their experience as family leaders is reflected in their organizing efforts in cooperatives and associations. The woman’s role in the separation and sorting of materials in the workplace is vital and should not be devalued because it doesn’t involve the machinery that the men typically operate. Read the full article (in Portuguese). Another study by the Brazilian IPEA institute found that two-thirds of waste pickers identified themselves as Afro-Brazilian. The study also says that many Afro-Brazilian waste pickers don’t enter the statistics because they are homeless or live in precarious dwellings. Afro-Brazilian waste pickers are also the majority of those living on the streets, according to the Ministry of Social Development and Against Hunger. Read the full article (in Portuguese). 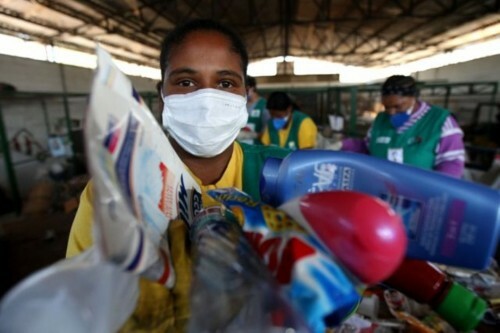 On October 26th, organized waste pickers of the Dominican Republic launched their National Movement. Its objective is to demand public policies that are socially inclusive for the thousands of recicladores that work the landfills and streets of the Dominican Republic. 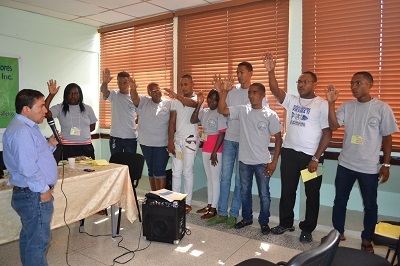 The movement was launched at the First National Conference of Waste Pickers in the Dominican Republic, held in Santiago de los Caballeros from October 24-26. Waste pickers from the ten municipalities participated. Also present at the conference were delegates from associations of waste pickers in Chile and Colombia. One of the primary tasks of the national movement is to bring the country’s national waste management law, which has been inaccessible to the public, to the public discussion and to make sure waste pickers’ voices are included. In the Dominican Republic, there are 348 open air dumps. 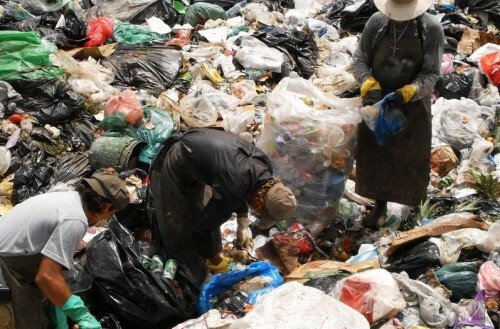 About 5,000 waste pickers work in these dumps. Read the full article (in Spanish). National Conference on the Environment. Photo: MNCR. The 4th National Conference on the Environment, held October 24-27, united 1,200 delegates from civil society, government, and the private sector to discuss the implementation of Brazil’s National Waste Policy. The MNCR participated in all the stages of the process, with months of local, state and regional conferences leading up to the main conference. In total, 40,000 waste pickers participated in the process. The biggest issue debated was incineration, which contradicts the national policy’s objectives of zero waste and social inclusion. There is a lot of pressure from industry and private waste management companies to promote incineration. Another controversial theme was that of Producer Responsibility. Waste pickers and activist groups stress that industries of packaging should should pay for the adequate final destination for their packaging. The opening of the conference began with a protest — organized by waste pickers — against incineration and privatization and in favor of socially inclusive recycling and recognition of waste pickers. 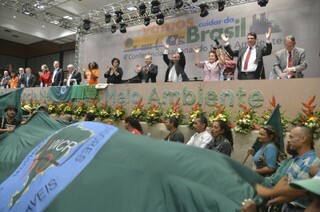 The National Movement put forth three proposals that were approved by conference participants: No public-private partnerships, the development of technologies for socially inclusive recycling, funding and support of organized and independent waste pickers (especially those working in precarious situations on streets and landfills). Read the full article (in Portuguese). Members of the National Movement of Waste Pickers of Brazil (MNCR) have been pressuring congress members to speed up the passage of a piece of legislation that would include waste pickers on the list of professionals that benefit from social security. Just as small farmers and artisanal fishermen, under this law waste pickers would contribute two percent of their own salary towards towards retirement. Congressmember Erika Kokay introduced another piece of legislation that presents some demands of the MNCR that would attend not just independent waste pickers but also those organized in associations. The MNCR is also demanding that the amount of time waste pickers have worked until the time of the law’s implementation be included. For the more than 70 percent of waste pickers in Brazil that receive a minimum wage or less, the 2 percent contribution would be much more accessible than the 11 percent that some currently pay. As the law currently stands, those who make above the minimum wage must pay 20 percent of their wages towards social security. Read the full article. 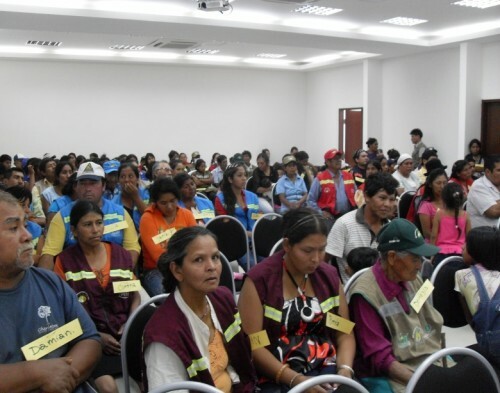 Waste pickers’ associations from seven cities in Bolivia that participated in the second national conference, marched to demand the passage of a law that recognizes them as workers and gives them the right to social security benefits. Read the article in Correo del Sur (in Spanish). For background, here is a press release from the 1st National Meeting in 2011. The National Movement of Brazilian Waste Pickers (MNCR) denounces statements made by Fernando Mello, the coordinator of a program that will ban the use of horse-drawn carts starting in 2015. “We want to end informal recycling, as well as other informal livelihoods, that many times operate in inhuman conditions, so that they can work formally and in more lucrative and dignified jobs,” Mello said. The MNCR denounces Mello’s statement because the waste picking profession was recognized by the federal government in the 2002 Jobs Classification. Their profitability does not necessarily depend on their insertion into the formal workplace. The waste picking profession is a dignified one, and its role in solid waste management is one deserving of protection. Waste pickers, just like other informal workers, demand respect for their right to work and recognition for the legitimate environmental service they perform. To desire the end of the waste picking profession is reproachful, inhumane, and undemocratic. See the full post (in English). After the massive mobilization of the Movement of Excluded Workers (MTE) and the Federation of Recyclers’ Cooperatives (CTEP), thousands of waste pickers in Argentina will be able to access better work conditions, better prices for recyclables, and wages above the minimum wage. Private companies, middlemen, and false cooperatives that live off the exploitation of waste pickers will be boycotted. Watch the video. On September 14, Costa Rican waste pickers hosted their First Waste Pickers Conference, in the city of San Jose. More than 100 recicladores from around the country participated, according to the newspaper La Nación. Their stated objective is to dignify the livelihoods of the families that collect recyclables. Waste picker delegates from other countries in Latin America were also invited. One of the topics was the integration of the Costa Rican waste pickers into the Latin American Network (Red Lacre). The main topics were the social integration of waste pickers, the strengthening of the national network, and bringing to the national level the importance of socially inclusive recycling. Read the article in La Nación (in Spanish). Screen shot from the documentary about Gericinó dump in Rio called “Catador”. In the first week of September, 246 waste pickers of the Gericinó dumpsite in Bangú, an underserved neighborhood in the Rio de Janeiro municipality, were facing the possibility of suddenly losing their livelihoods. The workers found out that the city, which has been in the process of closing the dumpsite for many months, was going to hand management over to a private company within two weeks time and that the dumpsite would be off limits. This sudden closure disregarded the promises made by Rio de Janeiro Mayor Eduardo Paes. Like the waste pickers of Jardim Gramacho, the Gericinó waste pickers should receive compensation and other benefits before the dumpsite is closed. They should also be integrated into a regional recycling plan that includes the operation of 7 recycling warehouses. But after days of protests in which waste pickers blocked the entrance to the dump, the city has postponed its closure date to early 2014. At the time of this update, there was nothing in place guaranteeing when the workers would receive their compensation, and only one of the warehouses has been built. Read the full article. On August 31, as part of the Red Lacre meeting held in Santiago, Chile, 15 delegates of Red Lacre visited waste pickers in the Los Molles landfill in the city of Valparaíso, a few days before its closure. The purpose of the visit was to show support for local organizing and reintegration at the new landfill. 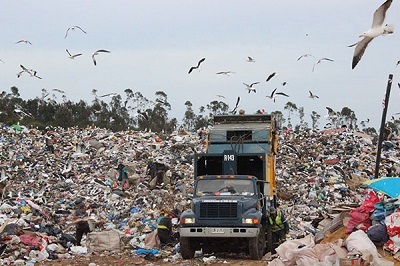 The Los Molles landfill had been open for more than 30 years. 100 waste pickers were working there. The process of closing Los Molles allows the majority of the full-time waste pickers there to continue working, with certain restrictions, until the end of the year. Concerned with the loss of livelihood for the waste pickers, the Movimiento Nacional de Recicladores de Chile, began supporting, together with the Fundación Casa de la Paz and a private recycling company, a capacity-building process for 67 waste pickers of Los Molles. This idea is that the group will become a cooperative. Read the full post in English or the full post or in Spanish. 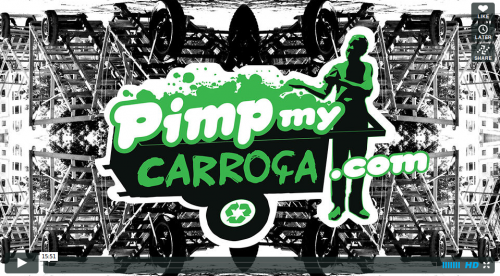 Pimp My Carroça is a project that gives visibility to waste pickers, transforming their carts through art, and raising their self esteem. It is a collaborative action that combines humor and awareness towards this issue, using graffiti as a possible field of interaction between the waste pickers and society. Pimp My Carroça has been working towards bringing the project to other cities. Watch the video (with English subtitles). November 8th was the Global Day of Action Against Incineration. 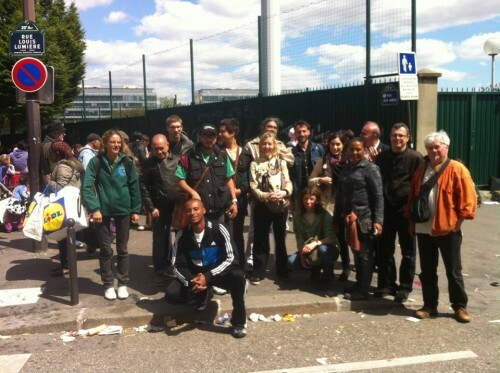 More than 25 actions in 14 countries across six continents were held to protest incineration and promote zero waste and socially inclusive alternatives. An international network of environmental, health, advocacy and anti-poverty groups organized the first global month of action against dirty energy from October 11 to November 11, 2013. Called Reclaim Power, the month of action included a November 8th day of action against something not traditionally seen as a form of dirty energy – burning waste, otherwise known as incineration. The Day of Action included a Global resolution against incineration as dirty energy, signed by 325 organizations from 60 countries. In the Philippines, South Africa, Brazil, and in Bahrain, waste pickers were involved in actions protesting incineration. See a list of activities held around the world and the full post. See a collection of photos from around the world on facebook page of the Global Alliance of Incinerator Alternatives (GAIA). Catadores meet Biffins in Paris. In this video taken at the Waste and Citizenship Festival in France, Roberto Prates Reis, of the National Movement of Waste Pickers (MNCR), talks about the reality of waste pickers (called “biffins”) in France: “It’s interesting when you start looking at waste management experiences around the world and you start to realize that the issue of livelihood is a universal one … In France, in the last 200 years waste picking has been disappearing… Municipal governments prohibited the activity, incinerators starting appearing, and private companies took over (and today, waste pickers are fined 500 Euros if they are caught collecting recyclables)…But today waste picking is returning in a big way because of unemployment and immigration…” See the full post. The event “beyond the recycling, the work of waste pickers!”, that took place on last Saturday, September 21, was a resounding success! The Valoristes, a solidarity cooperative, that organized the event, managed to recuperate and divert 24,500 containers from landfills! 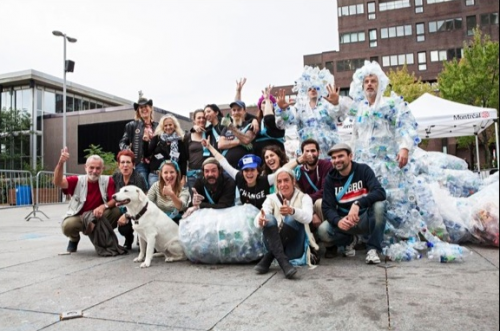 The objective of this day, which was to raise awareness among Quebecers to the socio-economic importance of the recuperation of beverage containers, beyond the environmental gesture of the deposit and recycling, was fully achieved: the center of the deposit points and the booth for awareness created for the occasion welcomed more than 180 people! Thanks to the participation of the Montrealers, waste pickers or citizens, the artists Pierre Allard (ATSA) and Phil Allard created a gigantic work, consisting of recuperated bottles. The bystanders warmly applauded and photographed the animation. “24,500 containers, it’s more than the 20,000 containers we hoped to collect! Beyond this trophy, the number and the diversity of people we have met who were interested in our cooperative project, reinforce the need to continue our work: to raise funds. Read the post.